Get your saw ready, Bugs, it's time to start hackin'. 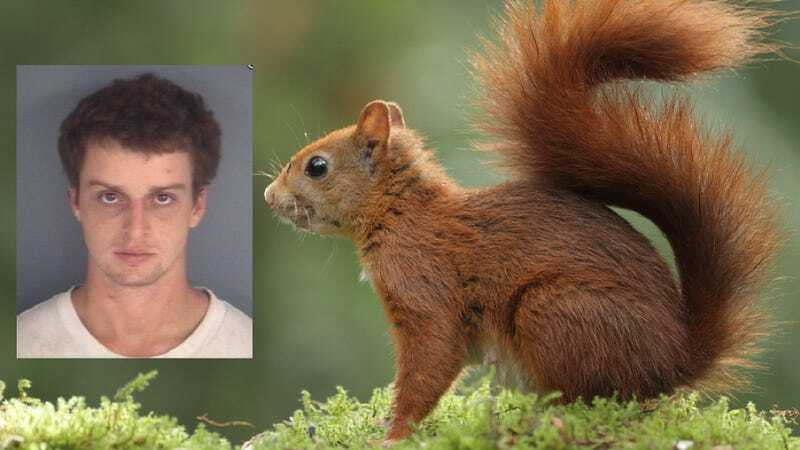 One of Florida's sons has run afoul of the law again, this time for drunk driving with a squirrel in his shirt. Police had received a report from motorists who said that a young man driving a silver pickup truck had nearly run them off the road outside of Jacksonville, Fla. They found Warren Thomas Michael, 23, driving a truck matching the description a few miles from where the report had been called in. Driving might be a bit of a departure from what they saw. Police said he was swerving his way down the road. When they pulled him over, his explanation for the erratic motor vehicle operation was that he was being eaten by a squirrel. Michael did in fact have a squirrel wrapped up in his shirt, but he also failed miserably when police confronted him with a roadside sobriety test, blowing nearly twice the legal limit into the breathalyzer. Even Florida considers a .08 blood alcohol level too impaired to drive. Perhaps young Warren should have kept the squirrel a secret, like a Spartan warrior. Spartan children were taught stories of courage and fortitude. One favorite story was about a boy who followed the Spartan code. He captured a live fox and intended to eat it. Although boys were encouraged to scrounge for food, they were punished if caught. The boy noticed some Spartan soldiers coming, and hid the fox beneath his shirt. When the soldiers confronted him, he allowed the fox to chew into his stomach rather than confess, and showed no sign of pain in his body or face. This was the Spartan way. But squirrel or no, he was still too hammered to be behind the wheel.